1915 Mourning envelope addressed to London franked by a 1d Bright Scarlet, SG 357, tied by a very fine LINCOLN SORTING CARRIAGE/WEST, W78. SCARCE. 1850 Cover from Boston to Peterborough shjowing on the reverse a very fine FRISKNEY UNDATED CIRCLE in black. 1836 Entire addressed to Louth showing a very fine two-line Barrow-/on Humber and Barrow/Penny Post, LI 33 and 39. Not listed by Oxley in Provincial Penny Post but listed in the County Catalogue. RARE. 1767 Entire from Appleby - Lincs, NE Scunthorpe - to Ferrybridge showing a fine two-line GAINS/BOROUGH, LI 321. 1839 A LOVE LETTER ENTIRE FROM SWINSHEAD ., LI 1039, to Horncastle, showing a very fine SPALDING/PENNY POST, LI 921. 1839 DEC 10TH Entire addressed to Spilsby with on the front a very fine LINCOLN Uniform Manuscript '4'. 1849 1d Pink stationery envelope addressed to Hungerford, Berkshire, with, on the reverse, a very fine FISKERTON (Lincoln) undated circle. 1809 Entire from Gainsborough written by Lawrence Kane and addressed to Mr B. Taft, at the Methodist Chapel, Birstal near, Leeds - an excellent three-page letter on Lawrence Kane's thoughts on women preaching...". Kane was a Travelleing Preacher. Showing on the front a fine GAINSBRO 152 mileage. 1836 Entire addressed to Bourn, Lincolnshire with, on the front, a Holbeach/Penny Post, LI 501. 1826 Cover, side flaps removed, addressed to Walworth, London and redirected to Spilsby, Lincs, showing on the front a fine Boxed 'Postage Not Paid/to London', L 273, and handstruck 2 Postage Due in black. Also on the front is a Lombard Street/3py P Paid in red. 1869 1d Rose-Red, SG 43, Plate 111, tied to envelope from Brigg (Lincs) to London and redirected to Dublin showing a circular-framed '1D' Postage Due of London. There is an H & K_PACT cds, HK P4, on the reverse. 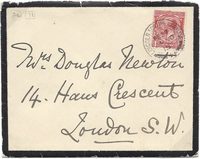 1879 2d Blue Registered envelope to Norwich franked by a 1d Rose-Red, SG 43, Plate 187, tied by a fine SPALDING 727 duplex. 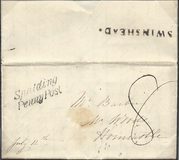 1840 Cover addressed to London showing a very fine THREE-LINE Peter./-Borough/Penny Post in RED AND Crowland No 3 Receiver in black. 1849 Cover from Spilsby to Muthill, Perthshire, showing a fine MISSENT/TO PERTH. 1829 Cover from Macclesfield to Donnington, Lincs, endorsed "NOT CASTLE DONNINGTON" and showing A BOXED 'MISSENT TO/DERBY'. 1908 Postcard from Spalding to Brighton showing a fine PETERBOROUGH . AND . ELY/SORTING CARRIAGE, W 540, Index '*'. Scarce. 1843 Envelope to Barrow, Lincs, showing a superb Beverley Uniform Handstruck '1D.' in Red, YK 348. 1840 1d Black, SG 2, Plate 8, I-L. A very fine four-margin example tied to cover dated 11th March 1841 addressed to Lincolnshire by a very fine GRAVESEND Maltese Cross in black. 1798 Entire addressed to Grantham showing a very fine CONCAVE JERSEY in Black, SG J1. Ex Moorcroft and Jay. 1869 3d Rose, SG 103, Plate 5, two singles tied to envelope to Brussels by two fine GRANTHAM 321 duplex. 1808 Entire sent FREE from London to Norfolk by W E Welby MP for Grantham, franked for another person this being an "Abuse of Privilege". The FREE has been erased and a two-line ABOVE PRIVILEGE/NUMBER applied, L 824. 1859 1d Rose-Red, SG 40, tied to envelope to London by a very fine MARKET RAISEN 512 numeral showing on the reverse a very fine circular-framed straight line LUDFORD. Circa 1770 Entire to London showing on the reverse a very fine two-line GAINS/BOROUGH together with a London Bishop mark for 10/AP, LI 321. 1885 2d Blue Registered envelope to Colchester franked by two 1d Lilacs, SG 172, tied by very fine BRIGG squared circles with a very fine oval-framed REGISTERED/BRIGG datestamp alongside. 1902 Postcard from France to Grimsby showing a fine boxed "L & L/S.T." of the LONDON & LEEDS SORTING TENDER, W 608. RARE. 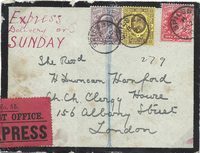 1935 Registered Envelope from Argentina to England showing on the reverse very fine oval datestamps "REGISTERED/31 OCT 35/LINCOLN-TAMWORTH S.C." sorint carriage. Wilson 84. 1837 Cover to Louth showing a VERY FINE WATH-UPON-DEARNE "WATH/JULY 3" in black, YK 3098. VERY SCARCE! 1901 Postcard from CLOVELLY to STAMFORD showing a very fine GREAT NORTHERN S.T. small boxed 'G.N./S.C.' Sorting Carriage, W598. LATEST RECORDED USE OF THIS MARK. Ex Wilson.